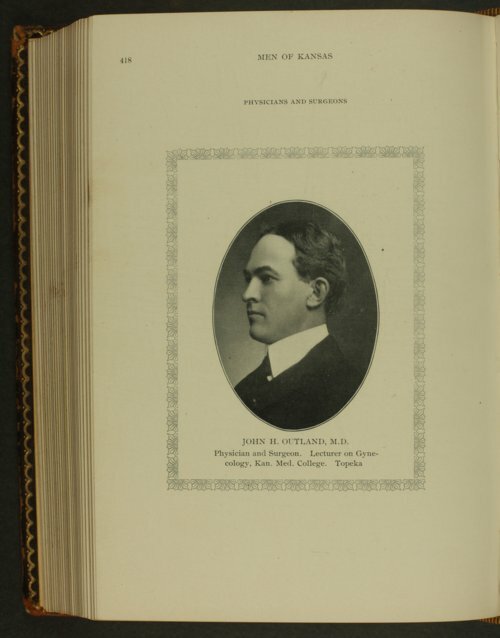 This is a photograph of Dr. John H. Outland, copied from Men of Kansas. Outland was born in Hesper, Kansas, later played college football and was twice named All American. After receiving his medical degree from the University of Pennsylvania, Outland returned to Kansas in 1900 where he set up his medical practice first in Lawrence, Kansas which led to his hiring as the head football coach of the University of Kansas for the 1901 season. He then moved his practice to Topeka, Kansas in 1904 in order to coach the Washburn University football team. In 1906 Outland moved his family to Kansas City, Kansas where he joined Trinity-Lutheran hospital in Kansas City, Missouri as a general practicing surgeon. While practicing medicine in the Kansas City region, Dr. Outland served for many years on the athletic board of the University of Kansas. He is the namesake of the Outland Trophy, an annual award established in 1946 and given to best interior lineman in college football. Outland was inducted into the College Football Hall of Fame as a player in 2001.